This study examined the influence of personal values on employees’ perceptions of organizational justice. Specifically, we tested whether anxiety-based values explain greater variance in perceived organizational justice compared to anxiety-free values. Employees of a health organization (N = 224) in Norway completed the Organizational Justice Scale and the Portrait Values Questionnaire. 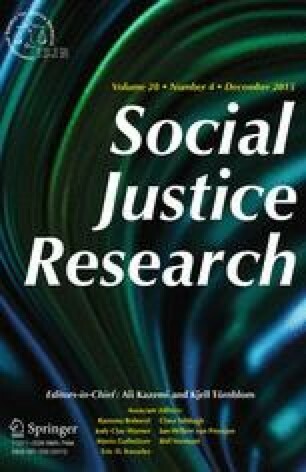 Results from multiple regression analysis showed that anxiety-based values (power, achievement, security, conformity, and tradition) explained a significant portion of the variance in employees’ perceptions of organizational justice, whereas anxiety-free values did not (hedonism, stimulation, self-direction, universalism, and benevolence). Power and tradition were the only anxiety-based values that significantly contributed to explain variance in justice perceptions. People with a high score on these values tended to score high on organizational justice. Taken together, the present findings suggest that employees may perceive and interpret organizational processes differently based on their value schema. We thank Professor Oluf Langhelle and Professor Knud Knudsen at the University of Stavanger for helpful guidance on the early versions of this manuscript, and for statistical advice throughout the process. Schwartz, S. H. (n.d.). Computing scores for the 10 human values. European Social Survey. http://www.europeansocialsurvey.org/docs/methodology/ESS1_human_values_scale.pdf. Accessed 14 Jan 2014. Wang, Q., & Yao, Y. (2011). The impact of cultural differences on applicants perceived fairness 2011. International Conference on Management and Service Science (MASS), IEEE, China. doi: 10.1109/ICMSS.2011.5998042.